This voltage converter circuit is built with TL497A and converts an input voltage of 5 to 12 voltage to a higher level of 15 - 30 volts. This is specially helpfull in mobile applications where power supply levels are commonly limited to 12 volts supplied by batteries. The voltage converter circuit uses the TL497A as a flyback-voltage converter. The choke coil is 40uH/2A. 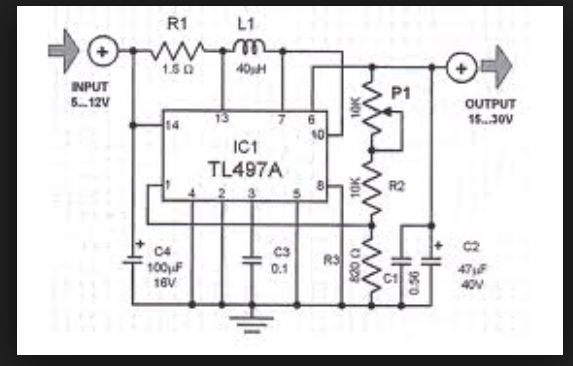 Capacitors C2 annd C1 suppress voltage spikes. The maximum output current depends on the difference between the input and the output voltages and is around 100mA. The ripple voltage is relatively low. The standby current is around 8mA and the efficiency is about 70%.